COMMUNION INSTRUCTION CLASS- If your child is ready to receive communion instruction, class will be on APRIL 13th from 10:00-Noon. We ask that an adult stay with their child to help them follow along. Please sign your child up to be sure we have enough materials for all. PALM SUNDAY BRUNCH April 14th – Altar Guild is hosting a wonderful brunch following the service. Only $5 per person or $20 per family. COMMUNITY PALM SUNDAY SERVICE APRIL 14th at 6:00 pm at Haysville Christian Church. 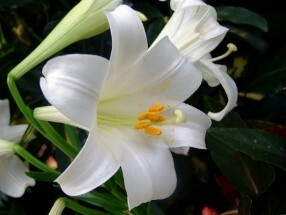 EASTER VIGIL & HOLY WEEK – Sign-up sheets to help with the services are on the shelf. Feel free to take a copy to practice. CONFIRMATION DINNERS – Thank you for providing a meal. It is very much appreciated!